Many flowers have all four sets of appendages present –a complete perianth consisting of both sepals (calyx), petals (corolla), and both sets of sexual organs –stamens (androecium) and a pistil (gynoecium). Such a flower is termed “complete.” Some species, however, bear “incomplete” flowers. Here are some examples of “perfect” (hermaphroditic), but incomplete, flowers. 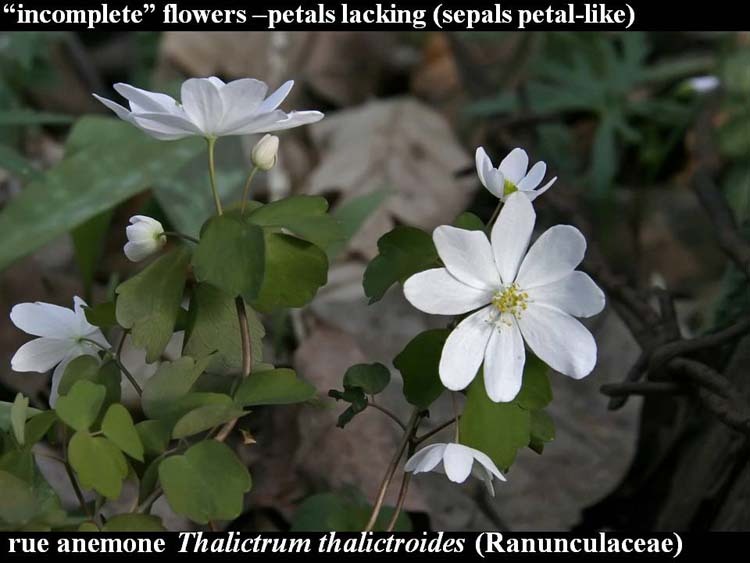 Below, rue-anemone, Thalictrum thalictroides. This is a spring wildflower in the buttercup family (Ranunculaceae), easily confused with Isopyrum biternatum (false rue-anemone). Rue-anemone flowers lack petals, but the sepals are petal-like. Below, American elm. Like many trees, elms are wind-pollinated. The flowers are protected by winter buds and they burst forth before the leaves, obviating the need for sepals. Being wind-pollinated, “advertising” is unnecessary, hence the flowers are apetalous as well. Elm flowers lack a perianth entirely. Below, black walnut. Many wind-pollinated trees are monoecious, i.e. the flowers are unisexual (male or female) but both types are found on a single tree. 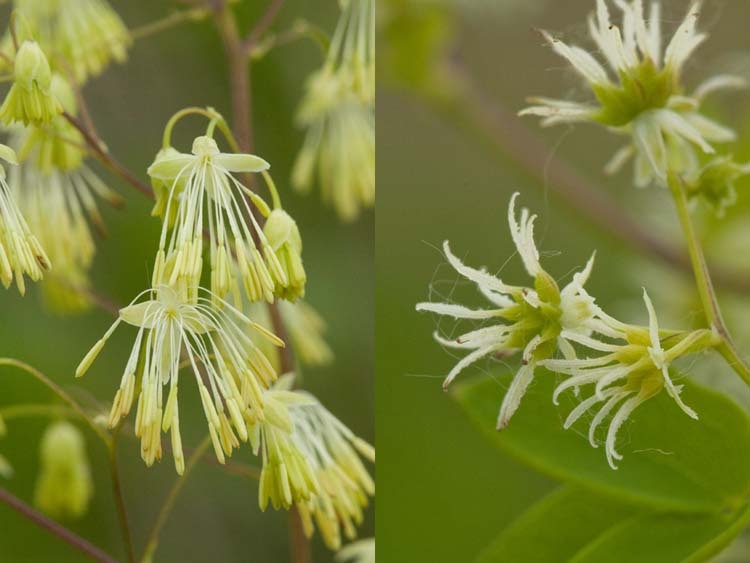 Commonly, they bear individually small but very numerous male flowers presented on drooping catkins well-suited to send pollen grains aloft into the passing breeze, while the female flowers are larger, produced singly (or at most in pairs or few-flowered clusters). Most members of the oak/beech/chestnut (Fagaceae) and walnut/hickory (Juglandaceae) exemplify this pattern. 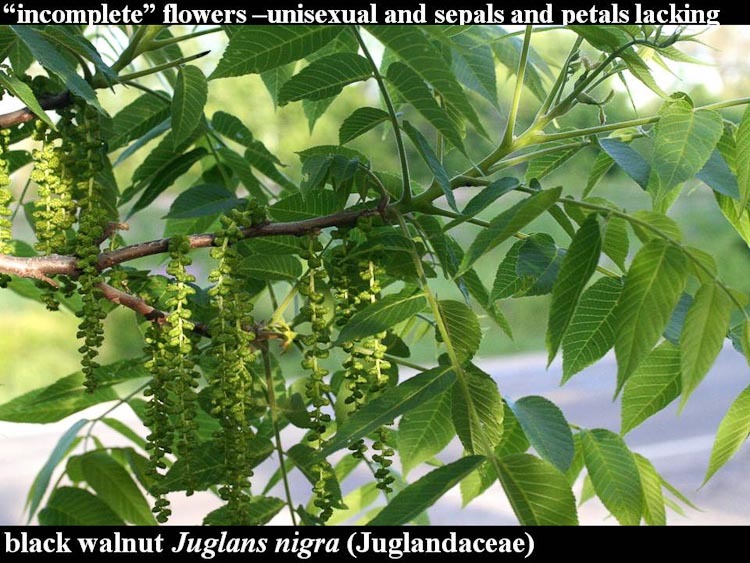 Black walnut is monoecious, producing separate male and female flowers on the same individual. Lacking a need for (sentient) pollinators, these flowers have no colorful perianth parts such as petals. In order to acquire the wind-blown pollen, the stigmas, antenna-like, are expanded like big catcher’s mitts. 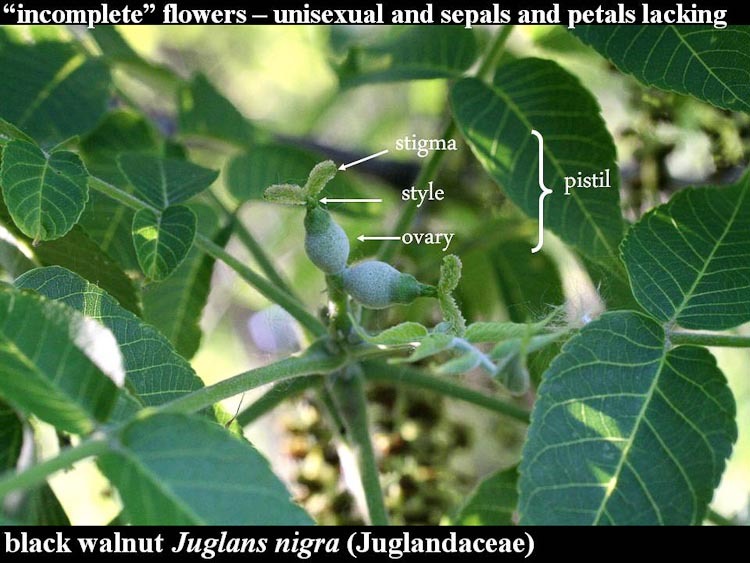 SLIDE the image to see flower parts labelled. Below, eastern cottonwood. 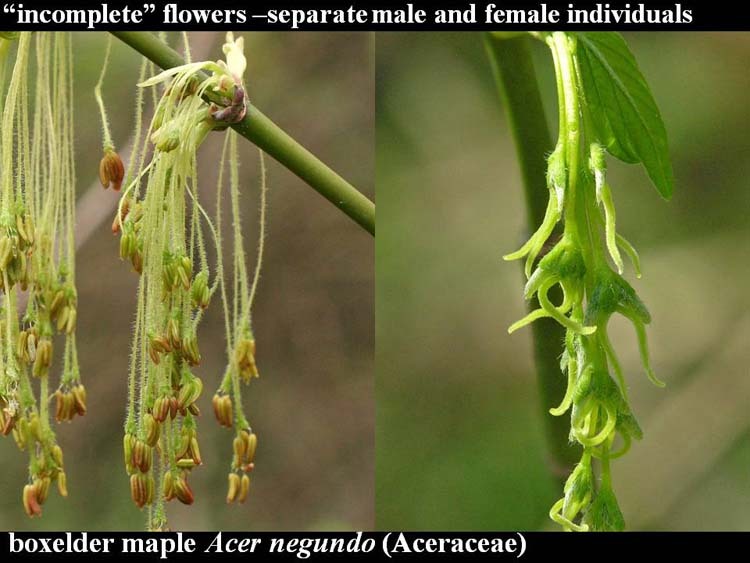 Dioecious species have wholly separate male and female individuals. Members of the willow/aspen/cottonwood family (Salicaceae) are good examples. Cottonwoods are wind-pollinated and produce their flowers –both types! –in drooping catkins. Note the very expanded stigmatic surface of the pistillate (female) flowers. Eastern cottonwood flowers. 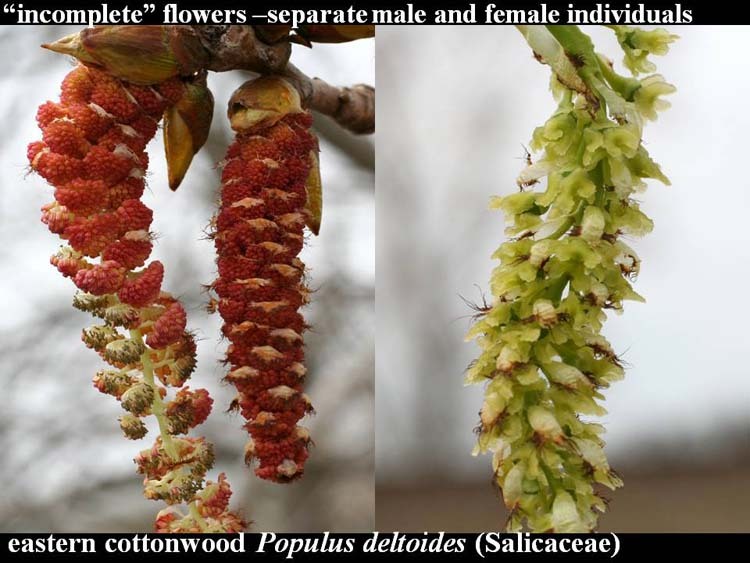 Left: staminate (male) catkins. Right: pistillate (female). Below, boxelder maple. Unlike most our other maples, which are monoecious, boxelder is strictly dioecious. Both types are produced in drooping clusters, and have long pedicels that increase exposure to the pollen-bringing wind. 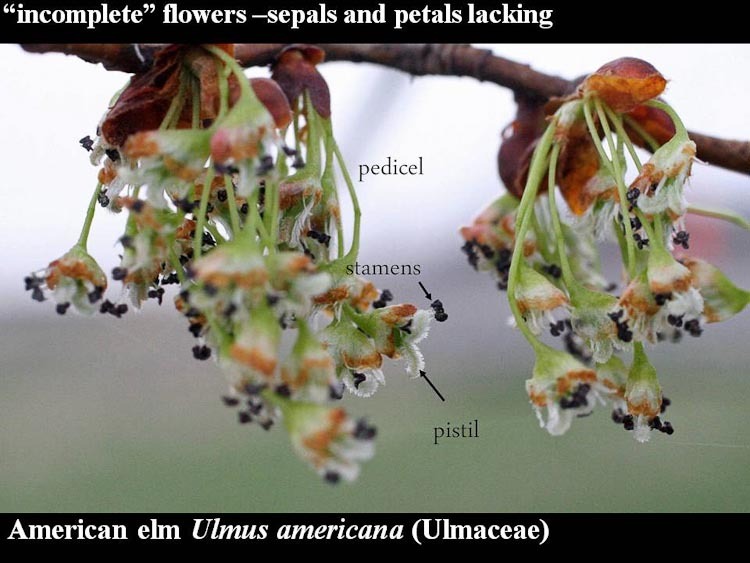 Boxelder-maple flowers. Left: staminate (male) catkins. Right: pistillate (female). Not only some trees, but some herbaceous plants are dioecious. 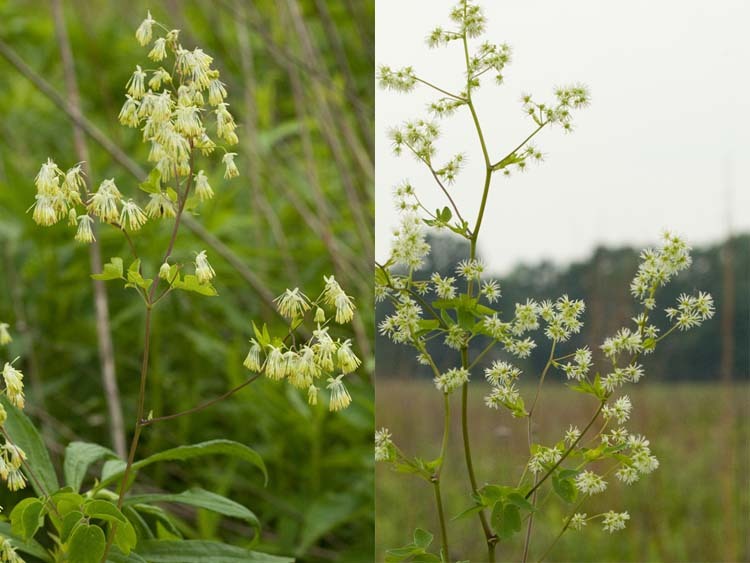 Below, see tall meadow-rue: male on the left; female on the right. Meadow-rue is a mainly dioecious herb.